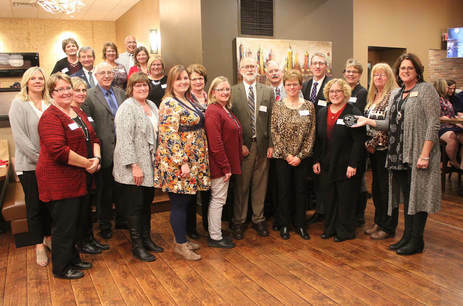 Minnwest Bank Luverne is this year’s Outstanding Corporation or Business. Minnwest bank was founded in 1987 during the farm crisis as ownership saw how important a community bank is for a community to thrive. Minnwest Bank’s interest in serving is inspired by their founder, M. D. (Pete) McVay and is shared by their 350 plus employees who are dedicated to building and sustaining their local communities. Support of communities comes in a variety of forms and includes volunteer work, philanthropic giving, corporate programs and educational events. As a company they provide each employee up to 8 hours of paid volunteer time, and in 2017 employees volunteered more than 600 hours during work time in addition to time serving on leadership boards and making fiscal contributions. Their employees are vested in making their community a better place to live. “We want to make contributions that will make a positive impact, specifically supporting new initiatives, and programs that cover gaps in meeting the health, nutrition or educational needs for the most vulnerable people in our communities.” Although it may not be known publicly Minnwest Bank is the core supporter for the successful and long standing Luverne Child Guide Program, a program that cares for all students but has a central focus of connecting at-risk students and their families with resources in our community and school. Minnwest Bank was key in providing the seed money for the newly created SWMN CEO program, a business community lead educational offering encouraging high school students from 7 local schools to think big and create ways to use their strengths to build business and shape the future. If we look back to the reasons why they created themselves in 1987 through good times and bad Minnwest bank has been serving and steadfastly supporting the communities within their footprint. Thank you and congratulations to the leadership and employees of Minnwest Bank Luverne. 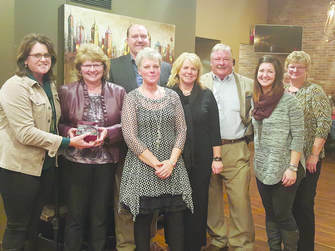 First Farmers & Merchants Bank of Luverne is this year’s Outstanding Corporation or Business. This award is given to a business that has created a culture of philanthropy within their organization. Leaders of FF&M share that “we are grateful to live in a community that recognizes the needs of our community.” Needs in a community cannot be met without the financial and volunteer support of businesses and community members. FF&M Bank financially supports youth programs, community fundraisers and events, educational needs, programs for senior citizens, agricultural projects and organizations, nutrition causes, health and wellness programs and preservation programs – 28 different organizations if they were all to be named. Bank employees are encouraged and supported to be involved on local boards, civic organizations and volunteer based causes. When roll call is complete their staff serves on 34 local committees and organizations. The bank cosponsors the free monthly family movie night and has served the Relay for Life and Backpack program from their beginnings. When a community need presents itslef, FF&M reacts often leading the charge with financial commitment. In house fundraising through bake sales and cash for jeans day on Fridays is used for charitable programs. Choosing to give gifts to those in need during the holiday over gifts shared with each other is another example of how FF&M bank staff put others before self. Giving of self is a family affair. Current Vice President/Branch Manager Ryan Wynia states, “Our employees are like family to us.” This environment was nurtured by former bank President Mike Engesser and we look forward to watching Ryan and his staff continue this culture. At FF&M Bank they take care of each other but together they take care of others. Congratulations to all of the employees at FF&M. Main Street Financial Services is this year’s Outstanding Corporation or Business. This award is given to a business that has created a culture of philanthropy within their organization. The generosity of charitable gifts given by Main Street Financial team members is not something they do because they are asked but rather they do because they believe it is the right thing to do. This philosophy comes with a strong belief that God is an awesome God and we are blessed to be a blessing to others and required to care for each other. The culture of philanthropy that has been created within the Mainstreet team started with a vision from Mike Cox and has continued to be nurtured by Nancy Van De Berg. Some of the many gifts that are so willingly shared are 5 paid hours for volunteer work, monetary gifts in honor of team members to local charities chosen by the team member, adopting a family or facility during the holidays in lieu of personal gifts and a favorite $2 Friday donation to wear blue jeans to work with quarterly proceeds being gifted to local needs. Congratulations to the team members of Main Street Financial for their generous hearts and their widespread community impact.